Nihon Eiho, or samurai swimming, began as a fundamental martial discipline, a military skill as highly regarded as horsemanship and archery, and just as practical. As far back as the Heian period (794-1191), swimming was a part of the formal training for the Japanese warrior, and there is no lack of military stories involving swimming skills. In the Edo Period (1603-1867), the art of Eiho achieved its peak. Several different ryu were already established, and teachers achieved a recognized status. Kenn Nomura, of the Aizu clan, would describe in his personal memoirs, written shortly before his death in Yokohama, the long hours of training dedicated to Eiho. His description of the proper way of swimming with armour puts as much emphasis on technique as it does on esthetics. Another witness to the mark left on him by the training is that as an old man, well into his eighties, Mr. Nomura would write that he dreamed of once again trying to cross the Okagawa River. He never fulfilled his dream, but carried the hope with him until his death. The Shogun himself, Ieyasu Tokugawa, learned to swim as a boy with Nobunaga Oda as his teacher. He prided himself on being able to swim long distances "without getting a single droplet of water" on his favorite helmet. Whether this was an exaggeration or not, it was obvious that Ieyasu placed a great deal of importance on Eiho encouraging his vassals to excel in swimming and horsemanship. Ieyasu passed this enthusiasm on to his descendants. Iemitsu Tokugawa tested the swimming skills of his immediate servants and retainers by observing them, personally, in the Sumida River. 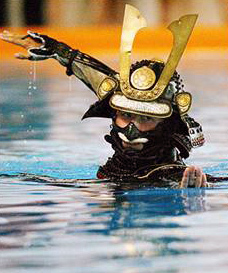 Daimyos followed the Shogun's example, and also encouraged their vassals to practice swimming. Eiho became a highly regarded skill for the samurai, and another tradition that has, fortunately, survived to this day. No exact number of ryu can he quoted for certain, but over ninety different schools of swimming were recorded during the Edo Period. Each ryu bore a particular (and usually local) characteristic and emphasized a particular purpose. Unfortunately, many have disappeared. There were, of course, many elements common to all ryu. The skills required to cross flowing waters with speed and economy of energy, swimming long distances, carrying something, and swimming with armour, among others, were taught by all ryu. The style favored by the Shogunate was the Mukai Ryu, founded by Masatsuna Mukai, commander of the Shogunate Navy. This style, perfected in the Sumida River, emphasizes the skill of keeping the face above water, and so being able to keep a watch for the enemy. Its slow and elegant swimming techniques were the ones most often depicted in prints. The surviving ryu can be divided into three groups by their line of origin: before the Edo Period (five ryu); during the Edo Period (six ryu), and during the Meiji Era (one ryu). Although developed as a martial skill, Nihon Eiho evolved into an art of considerable beauty and elegance. 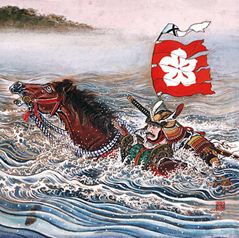 The techniques allowed the samurai to swiftly cross rivers, silently cross moats, swim undetected towards enemy camps during the night (with the hands extended in the front to feel for obstacles), and all executed with elegance and learned with the virtues of bravery, prudence and modesty. Each movement takes into consideration not only the human body, but even the ripples and waves created on the surface of the water, to keep them in harmony with each action. The learning involved knowledge of: Technique - swimming, diving, submerging and floating; Terrain - sea, lakes, marshes and rivers; Obstacles - currents, waves, muddy or dark waters, whirlpools, frigid waters; Endurance - long distance swimming., swimming with armour, swimming while carrying objects; Special Skills - How to rescue a drowning person and resuscitate a drowning victim; Traditions and Science - History of swimming (ryu), proper etiquette, and swimming medicine. Old scrolls equate these aspects of learning with the cultivation of the spirit in the following ways: diving fosters bravery; submerging, patience: floating, a serene mind; long-distance swimming, a strong will; swimming in currents, a fighting spirit; swimming in frigid waters, perseverance; the study of the history of the ryu and etiquette, respect and circumspection; and rescuing and resuscitation skills, benevolence. Nihon Eiho developed such grace and elegance that, in many regards, the comparison to the traditional dances of the fan or the sword are unavoidable.